In our previous discussions we came across 'How to read, write and parse XML using SAX , DOM and JDOM parsers' and 'How to convert JSON to and from a Java object'. In this particular blog we will see 'How to read a csv file in Java' and 'How to convert data from a csv file to java object'. A 'csv' file is a simple text file containing text data, separated with a white space or a comma, to read a csv file in java we just need to read the file line by line and separate the values splitting by 'comma(',')' or 'white-space(' ')' accordingly. Sample 'csv' file to read containing data separated by 'comma(',')'. This is the overall project structure for todays discussion, the sample csv file to read and parse data goes under 'csvFiles' folder. Please make sure add this folder to build path before we start. We have taken a sample csv file here that contains data separated by 'comma(',')', we just need to read the file line by line and split the values by 'comma(',')' to print values on console. System.out.println("CARS [year= " + cars + " , make="
+ cars + " , model=" + cars + " , description="
This is sample output, how the data will look like after reading from csv file and printing to console. Read data from a csv file and convert it to Java object. To convert data from a csv file to java objcet we will read and parse the file as explained above and than will store the values to a mapped Java Object to store all objects in a List. This is a sample java class containing fields corresponds to csv file data. 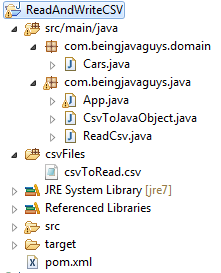 This is a sample java file containg code to read data from a csv file line by line and store the data in java object, and to make a list of car objects. At the end we have iterated the list values to print the data on console. + carListToPrint.get(i).getDescription() + " , price="
This picture shows the data on console, the data shown is being printed by iterating the carList over car objects. In this particular blog we came across 'How to read and parse a csv file in java' & 'How to convers data from csv file to a java object'. In upcoming blogs we will see more about Xml parser in Java and their implementation. Read more about XML & JSON under SAX & DOM & XML parser in Java JSON, and JAXB - Marshalling & Unmarshalling in Java categories.